O give thanks to the Lord, for he is good; *his mercy endures for ever. The Lord is my strength and my song, *and he has become my salvation. I shall not die, but live *and declare the works of the Lord. The Lord has punished me sorely, *but he has not given me over to death. Open to me the gates of righteousness, *that I may enter and give thanks to the Lord. This is the gate of the Lord; *the righteous shall enter through it. I will give thanks to you, for you have answered me *and have become my salvation. The stone which the builders rejected *has become the chief cornerstone. This is the Lord’s doing, *and it is marvellous in our eyes. This is the day that the Lord has made; *we will rejoice and be glad in it. Early on the first day of the week, while it was still dark, Mary Magdalene came to the tomb and saw that the stone had been removed from the tomb. So she ran and went to Simon Peter and the other disciple, the one whom Jesus loved, and said to them, ‘They have taken the Lord out of the tomb, and we do not know where they have laid him.’ Then Peter and the other disciple set out and went towards the tomb. The two were running together, but the other disciple outran Peter and reached the tomb first. He bent down to look in and saw the linen wrappings lying there, but he did not go in. Then Simon Peter came, following him, and went into the tomb. He saw the linen wrappings lying there, and the cloth that had been on Jesus’ head, not lying with the linen wrappings but rolled up in a place by itself. 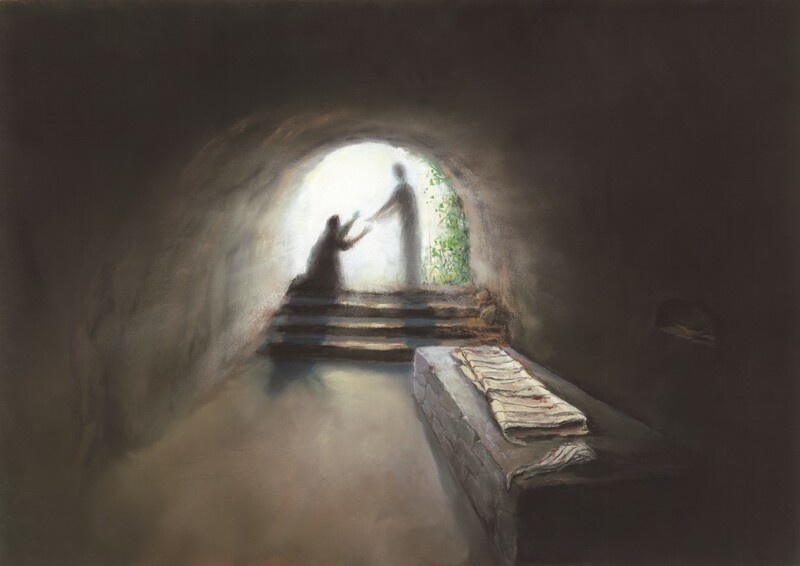 Then the other disciple, who reached the tomb first, also went in, and he saw and believed; for as yet they did not understand the scripture, that he must rise from the dead. Then the disciples returned to their homes. But Mary stood weeping outside the tomb. As she wept, she bent over to look into the tomb; and she saw two angels in white, sitting where the body of Jesus had been lying, one at the head and the other at the feet. They said to her, ‘Woman, why are you weeping?’ She said to them, ‘They have taken away my Lord, and I do not know where they have laid him.’ When she had said this, she turned around and saw Jesus standing there, but she did not know that it was Jesus. Jesus said to her, ‘Woman, why are you weeping? For whom are you looking?’ Supposing him to be the gardener, she said to him, ‘Sir, if you have carried him away, tell me where you have laid him, and I will take him away.’ Jesus said to her, ‘Mary!’ She turned and said to him in Hebrew, ‘Rabbouni!’ which means Teacher. Jesus said to her, ‘Do not hold on to me, because I have not yet ascended to the Father. But go to my brothers and say to them, “I am ascending to my Father and your Father, to my God and your God.“’ Mary Magdalene went and announced to the disciples, ‘I have seen the Lord’; and she told them that he had said these things to her. This week the Bishop of Oxford, John Pritchard, has an excellent suggestion. Although I find the style of his intercessions too demotic for my own taste, the guidance he gives in ‘The Intercessions Handbook‘ (p.60) resonates : ‘A helpful approach to praying at the great festivals of the Church is to use one of the evocative images of the biblical story as the theme which runs through the intercessions. In the following examples, the powerful image of the stone which was rolled away from the tomb is paralleled with the need for stones to be rolled away from some of the tombs in which we live‘. Heavenly Father, you have not made us for darkness and death, but for life with you for ever. Alleluia! Lord, we ask you to help us roll away the stones that form walls separating your Church into different traditions: at times these seem almost like separate entities, a series of Churches within your Church. Let us break down these stone walls, which threaten our unity and at times threaten to block out your light altogether. Today, of all days, let us raise our voices in unison and in harmony in a great hymn of rejoicing and praise: Alleluia, alleluia! He who was dead now lives for evermore! Lord, raise us from darkness to the light and hope of your presence: in your mercy, hear our prayer. Lord, we praise you for the primeval rhythms of the seasons as we once again witness the green blade rising from the dark earth, where it has lain buried for many months. Although winter may be reluctant to loose its grasp, we have the assurance of knowing that Spring will assuredly follow. In the beginning, your creation Adam was a gardener and today your risen Son appeared as a gardener and brought a new beginning for mankind, showing us that through your grace, all can be life. Ever-living Lord, help us to celebrate our joy in the resurrection of your Son and to express in our lives the love we celebrate. Let us work to break down barriers between us, while learning to distinguish with sensitivity between our neighbours’ possible loneliness and need for company and their possibly real desire for privacy. May all relationships be strengthened and hurts be healed. Lord, we pray for those who are troubled or anxious about the future; for the chronically ill and for all who walk in darkness; for all who are in pain and all who have lost hope: may they find a new vision and comfort in the power and promise of the resurrection. Lord, we remember all who have lost those whom they love and for whom they sorrow greatly. May they be comforted this Easter by the promise of the resurrection. And bring us, we pray, at our last awakening into the house and gate of heaven, where there shall be no darkness nor dazzling but one equal light; no noise nor silence but one equal possession; no ends nor beginnings, but one equal eternity, world without end.